Kylian Mbappe after scoring his side fourth goal during the final match between France and Croatia at the 2018 soccer World Cup in the Luzhniki Stadium in Moscow. Les Bleus have done it again. 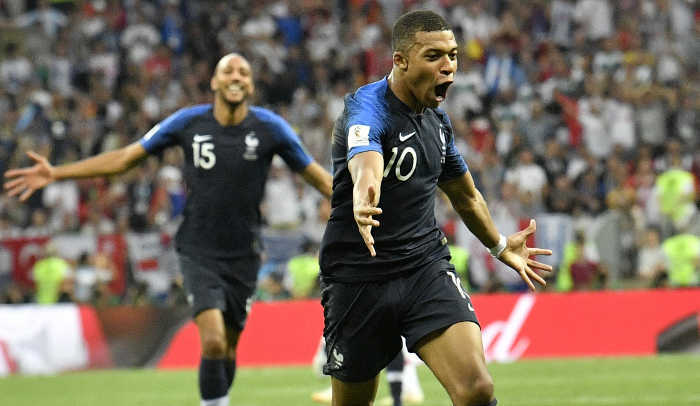 France’s National Football Team emerged the 2018 Fifa World Cup Champions in Russia after they beat Croatia 4 goals to 2 in a scintillating finale. This is France’s second world cup the first one having come twenty years ago in 1998. France’s first goal was an own goal by Croatia’s defender Mario Mandzukic. Antione Griezmann converted a penalty, the first time in history the Video Assistance Referee has been used in a world cup final. Manchester United’s Paul Pogba and 19-year old Kylian Mbappe scored two more before the 70th minute to give the French a three-goal lead. France’s 3-goal lead was reduced by an embarrassing error by France’s keeper and captain Hugo Loris, who failed to clear a back pass.